Do You Know Where Your Accounts Payable Invoices Are? If the answer is "No" then you need Vision360 Enterprise. Vision360 Enterprise makes accounts payable reporting a breeze. With a simple click of a button and by selecting the type of report needed, accounts payable departments can now generate detailed reports on the fly! This built in functionality further provides visibility into the accounts payable process. Whether selecting from a pre-defined list of accounts payable reports or if you require more complex and detailed reports Vision360 Enterprise makes it easy to see all of the information you need to better manage your payable process. 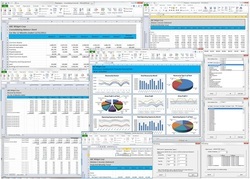 Vision360 Enterprise make month-end, quarter-end and year-end reporting and closes a breeze! A significant amount of time and costs are saved by simply clicking a button to access the payment status, history and details of any vendor invoice. By maintaining a complete audit trail of each and every invoice and transaction the accounts payable department will have a complete history to ensure compliance is maintained.